By 1180s the arable land of the village was divided into three fields- the North, East and South- around the village – in regular use under a 3 yearly rotation (barley, wheat then oats/peas/ dredge or fallow) till 1700. From the middle ages Harston’s sheep and cattle had been entitled to common land in much of Hauxton and Newton, both on the Moor and along the river meadows. Many peasants kept sheep, often in largish numbers rising from around 40 to 500 in some cases around late C14th. The villagers kept many mares (1-2 each), which when not working, ran free over the meadows. Rights of pasturage were restricted to particular seasons and areas by C15th. Most peasants had only about 15 acres of land. Before 1400s most Manor lands were worked by village tenants giving so many days work for their lord, for harvests, ploughing, etc but by 1400s most tenants preferred paying cash rents for their tenancy and the lord gave a copy of the agreement to the landholder – hence the name copyholders. The Lord of the Manor still retained hunting and mineral rights to the land, but the landholder could pass his land on to his descendents. They still had to attend the Manorial court and ask for permission to take over the land, and pay a ‘Fine’ to do so. By 1180s the three fields of arable land surrounding the village were called the North, East and South, names in regular use till 1700, and a field pattern kept largely the same until Inclosure in 1799. From C14th the East field was known as White field, with the north-eastern area name changing to Peasehill (Pessills). From 1630s Northfield was sometimes known as Park field but in C18th was renamed Red field. 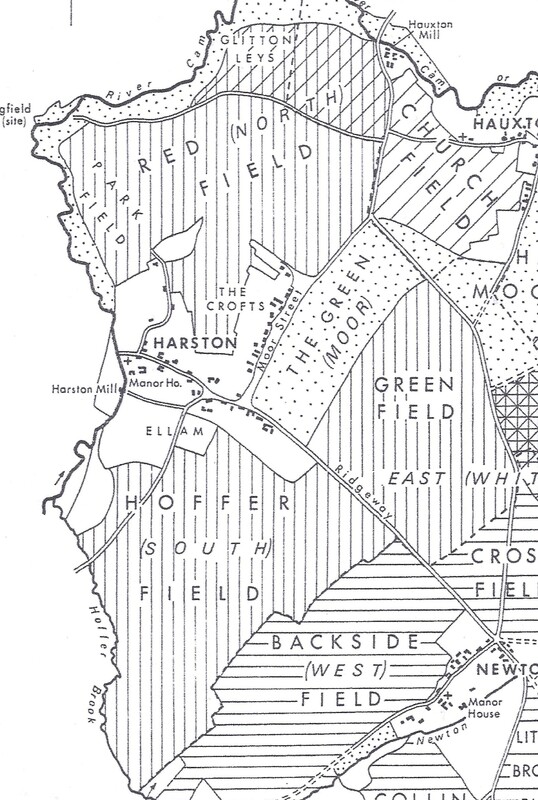 The South field became known as Hoffer field (bounded by Hoffer Brook) and later in 1790s as Baggot field (near Baggot Hall Farm). 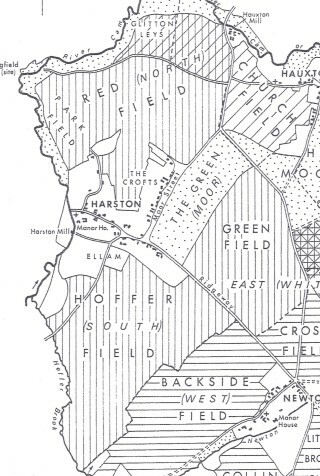 The part of the Eastern field, now bordering the east side of the A10, was called Green field, after the large adjoining green, there by 1452, and forming part of the village’s public moor.